The women's basketball team will play in Waco at 4:30 p.m. Saturday, March 23, at the NCAA tournament game vs. Baylor University. 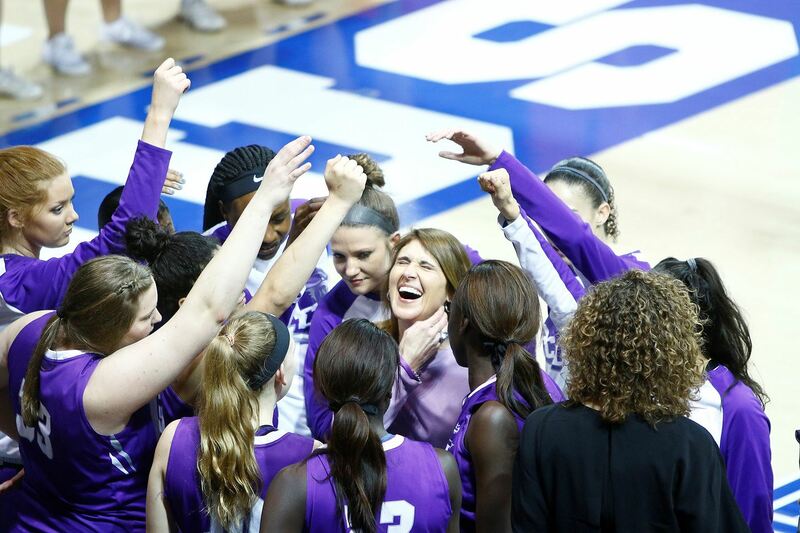 Abilene Christian women’s basketball hops on the bus headed for Baylor and the NCAA DI Championship this week nearly seven years to the date Julie Goodenough was hired by then-athletics director Jared Mosley to be the program’s sixth head coach. The Haskell, Texas, native was hired March 27, 2012, and officially introduced several days later at a press conference held at the Hunter Welcome Center, where she stated her goal of getting the Wildcats into the NCAA tournament. Mosely – now the associate vice president and chief operating officer with North Texas Athletics – also sounded prophetic in his comments when he said, “I believe she’ll be a tremendous asset not only to our women’s basketball program, but also our athletic department in general and the university as a whole. Two months into the job Goodenough revealed her first recruiting class, which included future four-year starter Whitney (West) Swinford. The 5-11 guard from Gregory-Portland High School was the first ACU player to compete for four years under Goodenough’s direction, totaling 1,195 points, 287 assists and 234 3-pointers. She also holds the distinction of being the only Wildcat to play during the program’s last NCAA DII Tournament appearance (2013) and its first DI posteseason (2016 WNIT) as Renata Marquez (11.9 ppg, 5.9 rpg) graduated with a degree in nursing following the 2013-14 campaign – ACU’s first in the Southland Conference. Despite playing the likes of Stephen F. Austin, Texas A&M-Corpus Christi, Lamar and Central Arkansas once or twice during the regular season, the Wildcats have never experienced a losing DI season or have finished below .500 vs. the Southland Conference. For a little bit of perspective, ACU’s six-year record against the league is a stout 72-32 (.692) while its longtime arch rival Incarnate Word, which left the Lone Star Conference the same year as the Wildcats, has yet to finish a season with more than seven Southland wins. Marquez’ last year with the Wildcats also was the freshman season for a group affectionately known as The Big 4: twins Lizzy and Suzzy Dimba, Alexis Mason and Sydney Shelstead. What this group accomplished has been well documented over the years, but they had their own growing pains to experience prior to the glory of winning 33 of their last 36 Southland Conference games and twice going to the WNIT as the league’s regular-season champions. The Wildcats’ first DI season always will be highlighted by the one-point win at Texas Tech and a Thanksgiving week triumph at UT Arlington, but before and after those victories were some painful losses against the likes of North Texas, Tulsa and TCU. Several Southland teams also got in their kicks, including SFA, which bested ACU on its home court in Nacogdoches, 80-59. The following season was a bit of a roller coaster ride with West – now a junior – in the driver’s seat as the starting point guard accompanied by the sophomore quartet in the starting lineup. Expectations for the team rose quickly when they got off to a 7-2 start with wins over Eastern Washington, George Mason and UMKC, but a 15-point loss at Kansas State coupled with three-straight conference losses forced Goodenough to shake up the starting lineup, beginning with the team’s 75-59 win at McNeese. That night’s game in Lake Charles proved to be one of the most memorable of Shelstead’s career as the post player from Mineral Wells, Texas, scored 19 points off the bench vs. the Cowgirls on 9-13 shooting. From there the Wildcats lost in overtime to SFA at home and let a late lead slip away at Moody Coliseum against Sam Houston State to fall to 1-5 vs. the Southland, but someway, somehow they bounced back to win seven of their next nine conference games to get to 16-10 overall and 8-7 within the league. Late in the year there was chatter about a potential WBI Tournament berth, but a 21-point loss at New Orleans (Randi Brown, 27 points) combined with a year-ending 60-40 defeat at Corpus Christi brought all postseason planning to a screeching halt as ACU finished the year 17-12. For the next two years, however, it always felt like a postseason tournament berth was a foregone conclusion as there was no better staring five in the league between 2015 and 2017, first with West – a senior point guard in 2015-16 – and then with Breanna Wright – a freshman who started 31 games alongside the Big 4. Both these teams won the Southland’s regular-season crown despite being challenged two straight years by Central Arkansas. The Sugar Bears finished 1.0 game behind the 17-1 Wildcats in 2016, and tied them with a 16-2 record in 2017. Wright has continued to pilot the Wildcats’ starting lineup over the past three seasons, having played in all 94 games (93 starts) with per game averages of 11.1 points, 3.6 rebounds, 4.3 assists and 34.2 minutes. She’s also been one of the steadiest shooters at the free-throw line as her .853 career free-throw percentage is the highest among any Southland Conference player. SFA’s Tamara Marion entered this season as the Southland’s career leader with a .844 free-throw percentage. Wright will lose a key asset in senior Sara Williamson (12.2 ppg, .619 FG%, 3.2 rpg, 4.8 apg) at the completion of this season, but will still be surrounded the following year by an experienced veteran group composed of Alyssa Adams, Lexie Ducat, All-Southland Second Team honoree Dominique Golightly, and Makayla Mabry. With these pieces and more in place for 2019-20, it’s not too much of a stretch to believe there may be more than one shining moment for Goodenough’s Wildcats.